The exact origin of The French Bulldog (aka ‘Frenchie’) is not known but it is most widely accepted that it was brought to France by lace workers during the industrial revolution. They are a small sized short coated brachycephalic (short nosed) breed. The French bulldog’s main distinctive features are its erect bat like ears and its concentrated gaze. 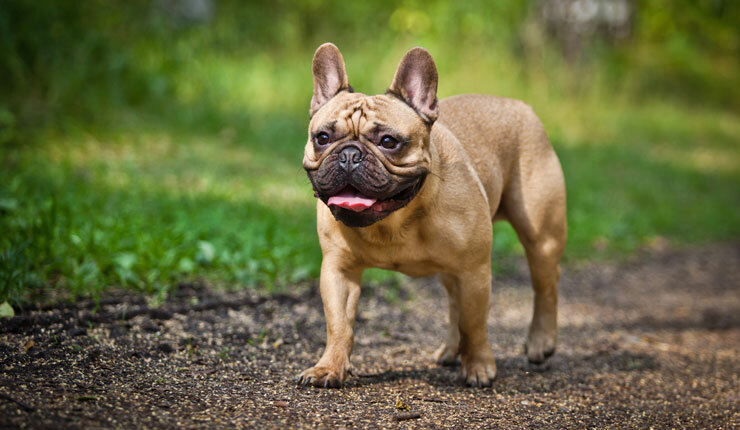 French bulldogs come in a variety of colours and coat patterns including brindle, fawn, pied, white, black, black & white, black & tan, grey/blue and chocolate brown. They are easy going pleasant companions who are fun loving and affectionate. However generally they are one person dogs and can become jealous of other pets or children. As they are brachycephalic dogs, they are prone to respiratory problems and require special management to minimise complications and ensure longevity. BAS (Brachycephalic Airway Syndrome)- A combination of anatomical features including narrow nostrils elongated soft palate and deformed throat result in breathing difficulties and require special management and sometimes surgery. Cherry Eye – Prolapsed gland of the third eyelid causes irritation to the eye and requires surgical replacement into its correct location. Corneal Ulcers- Large eyes are easily injured. Damage to the cornea causes extreme pain and symptoms such as tearing, squinting, pawing at the eye and sensitivity to light. Hypothyroidism (Underactive thyroid gland) Seen in middle aged dogs, common signs include obesity, lethargy, skin and ear infections. Pannus – Deposition of black pigment on the cornea and subsequent drying of the cornea. Hemivertebrae – Congenital incomplete fusion of vertebrae. Dystocia (difficulty giving birth) – over 80% of litters delivered require caesarean section to due to their large skull and narrow pelvis. Looking for French Bulldog insurance?